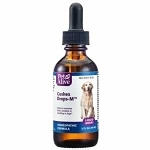 If your pet suffers from allergies or skin problems, immune disorders, respiratory or cardiovascular diseases, eye disorders such as failing vision or cataracts, or general problems associated with aging, an antioxidant supplement may reduce the cellular damage done by free radicals and help return your dog or cat to a state of good health. Antioxidant supplementation is especially important for animals that are being treated for cancer or have other diseases that compromise their immune systems. Vitamin A is manufactured by humans and animals from pigment substances called carotenes, which are commonly found in plants. Vitamin A is fat-soluble. A deficiency of vitamin A may result in night blindness; increased susceptibility to infections; rough, dry, scaly skin; loss of smell and appetite; fatigue; lack of eye-tearing; and defective teeth and retarded gum growth. Vitamin A is especially beneficial to aging animals, and those suffering from respiratory problems (asthma, bronchitis), and atopic dermatitis. Mixed Carotenoids contains antioxidants found in carotenoid-rich foods. Carotenoids are the red, orange and yellow plant pigments that give fruits and vegetables their vivid colors. All fruits and vegetables contain varying concentrations of carotenoids, but their colors are often covered up by green chlorophyll contained in the plant. There are more than 600 different naturally occurring carotenoids. Some of them have been identified as playing a vital role by protecting cells and tissues from the damaging effects of free radicals and singlet oxygen. Carotenoids have also been shown to enhance immune system function, and inhibit the development of certain types of cancers. Lycopene, the carotenoid that gives tomatoes their red color, is particularly effective at quenching the destructive free radical singlet oxygen. Lutein and zeaxanthin, found in corn and leafy greens such as kale and spinach, provide antioxidant protection in the macular region of the eye. Lutein and zeaxanthin have been found to reduce the incidence of cataracts. Spirulina is one of the richest beta-carotene foods and helps support the immune system and your pet's skin and coat. Carrot Powder contains important plan-pigment antioxidant carotenoids that benefit the eyes and skin. A deficiency of carotenoids may result in vision problems, especially cataracts. Mixed carotenoids are especially beneficial to animals with cancer, cataracts and other eye disorders, respiratory problems and allergies. Vitamin C is the body's primary water-soluble antioxidant, which makes it an important weapon in the immune system's arsenal against bacteria and viruses. It also helps protect unsaturated fatty acids, and the fat-soluble vitamins A and E from being oxidized, therefore protecting their potency. Since your pet can't manufacture it, vitamin C must be obtained through diet and supplementation. A deficiency of vitamin C may result in bleeding gums, swollen or painful joints, slow healing of wounds and fractures, the tendency to bruise or bleed in any part of the body, and scurvy. Vitamin C is especially beneficial to animals with any type of chronic disease, infection, allergy or dermatitis. A deficiency of vitamin E may lead to a rupture of red blood cells, loss of reproductive powers, abnormal fat deposits in muscles, degenerative changes in the changes in the heart and other muscles; and dry skin. It is especially beneficial to aging animals, and animals with heart disease, cancer and atopic dermatitis. Curcumin (turmeric) is a potent antioxidant that helps maintain the body's normal inflammatory response and has particular benefits to joint health, liver support, gastrointestinal health and cardiovascular function. A deficiency of selenium may result in premature aging, heart disease, dry, flaky skin and sagging skin. Selenium is especially beneficial to animals being treated with corticosteroids, which are known to deplete selenium. Selenium is also beneficial to animals suffering from cancer (and as a cancer preventative) and to those diagnosed with inflammatory bowel disease. Caution: Selenium can be toxic in overdose. Only give supplements containing selenium that are labeled for cats and/or dogs. Milk Thistle Extract, from the bright pink-flowered thistle that grows wild along roadsides, is the favorite herbal liver protector. Valued for its medicinal and nutritional properties for more than 2000 years, milk thistle has been commonly used to treat liver diseases since the Middle Ages. 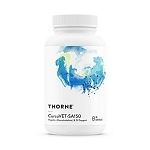 Today, more than 150 clinical studies have shown that milk thistle has a beneficial effect on the liver in humans and in animals. Milk thistle extract is especially beneficial to animals with liver disease or damage, and to all animals as a protectant against environmental chemicals and pollutants. Grape Seed Extract promotes cellular health and improves blood circulation by strengthening capillaries, arteries and veins. Aging animals and those with cataracts, cancer and heart disease may benefit from grape seed extract. 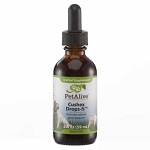 Alpha Lipoic Acid (ALA) is often called the "universal antioxidant" because it works in both water and fatty tissues, thus providing protection to all your pet's cells and organ systems, including the brain. Alpha lipoic acid enhances the antioxidant properties of vitamins C and E and is especially beneficial to aging dogs. Quercetin, Rutin and Hesperidin are bioflavonoids with strong antioxidant properties and help to promote healthy circulation, maintain collagen and block the release of histamines to help pets with allergies. Helps to prevent light induced damage to the eyes and may benefit pets with age-related macular degeneration and glaucoma. Why Does my Pet Need an Antioxidant Supplement? Unlike people who hopefully eat a diet that includes plenty of fresh fruits and vegetables that are rich in antioxidants, most dogs and cats eat commercial pet food containing a minimal amount of antioxidants. Whether your dog or cat is healthy or fighting a disease, an antioxidant supplement can provide immune support, protect it from environmental toxins, and may even help prolong its life.